Everybody has a story. Here's a little of mine. Stumbling from my bedroom in a half-asleep daze I made my morning rounds. “Good morning,” I say to my daughter. Her room, which was clean when she went to bed last night, is covered in doll clothes. One doll is dressed fancy and sipping tea, while another has pajamas on and is propped up receiving medicine. “OK. Headed into the shower,” I mumble back. “Good morning,” I say to my son. All I can see of him is the back of his head peeking up slightly under the covers. He is on his tummy reading. I see him raise his finger up in the air for me to wait, a gesture I recognize well. “Just needed to finish that paragraph,” he says a moment later without looking up at all. “Good morning,” he says and promptly begins reading again. Some days I honestly have no idea how I got where I am. I can retrace the steps and go over the facts, but the reality of my life is strange to me. * I have been married for almost 15 years and our dating anniversary of 20 years is this summer. * My children are not babies. * Depression has been my cloak and shield and I’m having trouble letting it go. * My parents are getting older. * I still feel like a teenager who doesn’t understand the world and how I fit in it. * Today marks the one year anniversary of my blog. All of these truths have different feelings attached that are mixed-up and hard to separate or express thoroughly. I was challenged this week to come up with a 30 item Bucket list. Should be an easy thing to do, but I found it painful and nearly impossible. Why? It is scary to admit that I want things because then I have to work hard to make them happen. “She put it out there. Would people read? Would they care? Would they even notice? I remember being so scared to write anything. Worried people would find me self-centered, stupid or just boring. As scary as it was, I have been grateful daily that I did it. My blog is still so tiny compared with the size of others. A baby really. But it’s my baby. I birthed it and I’ve been feeding it and nurturing it for an entire year. Amazing things have happened because of it. * I have had an outlet for working out some major issues that otherwise might have stayed dormant and hidden. * People have reached out to me and shared their truths. I’ve inspired a few people to start following their dreams, which I find unbelievably amazing. * I was published on Mamalode and might even get a little check from that. * I’ve been featured on Cap City Moms and I’m looking forward to helping that website continue to grow and be a positive place for woman to tell their stories. Plus, I’m crazy for the founder of the website. Seriously, Jill is all kinds of awesome. * Just got an e-mail inviting me to write for a non-profit organization that promotes empowering women to follow their dreams. So, things are happening and I’m excited/terrified/nervous/thrilled/proud and many other things. I’m a mixed up jumble of nerves and it’s not a bad place to be. Nothing good happens from staying stuck. 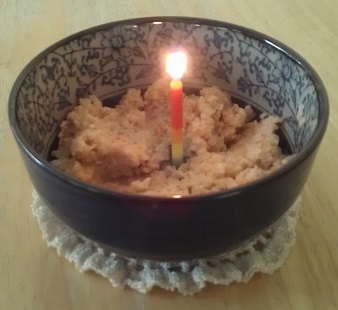 So, I’m saying Happy BlogBirthDay to myself in a matter that seems fitting. For everyone that has read Bridgette Tales, even once, thank you a million times over. You have no idea how much it means to me when you read, comment or share my blog. It is confirmation that I am doing something worthwhile and that people are touched, entertained, inspired or moved in some way. It has helped me in ways I can’t even begin to express. Sending you all love from my heart to yours. This entry was tagged Blog, blogging, Celebrate, Dreams, Fear, Life, Marriage, motherhood. Bookmark the permalink. CONGRATULATIONS!!! So proud of you!!! I love you past the moon and back! Leah Marie on Just write already!